The all-new and totally redesigned 2015 Nissan Murano is now available at our dealership—what a way to break in the New Year! We previously wrote a post on the details of the new Murano when the industry buzz first broke. But we know it’s still the holidays and you want to be able to enjoy your down time, so here are some fast facts about the 2015 Nissan Murano and what makes it so appealing. This third-generation Murano takes its cues from the future, expressed in the form of the Nissan Resonance Concept vehicle. The 2015 Murano carries forward Nissan’s new design direction with features such as V-Motion front end, a unique “floating” roofline, LED boomerang-style headlights and taillights, and more efficient aerodynamics. 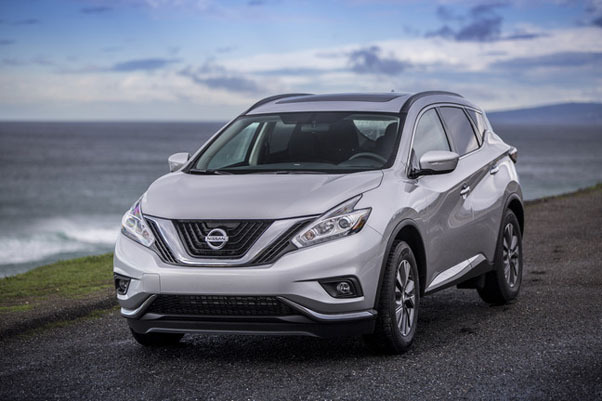 Fuel economy is projected to increase by approximately 20% versus the current generation Murano, due to the approximate 145-pound overall weight reduction, enhanced aerodynamics and engine/transmission efficiencies. The instrument panel height is lower than previous Muranos. Centered between the outer wings is a large information and control center with an available 8.0-inch color display with multi-touch control. The number of audio and navigation switches has been reduced by 60% – from 25 to 10 – for a more user-friendly experience. The new Murano shares the look and feel of the Resonance with an upscale “social lounge” interior with premium materials, advanced and purposeful technology, and a low, wide center console that encourages conversation between front and rear passengers. Adding to the driver’s sense of connectedness with security is Nissan’s Advanced Drive-Assist™ Display, an enriched version of the popular instrument panel feature offered in both the Altima and the Pathfinder. For use in the new Murano, there are a number of new features, including a 7.0-inch high-resolution color display. Murano incorporates up to four cameras (front, rear, two side) and three radar sensors (one front, two side) to provide input to a range of available technologies, including Blind Spot Warning (BSW), Predictive Forward Collision Warning (PFCW), Forward Emergency Braking (FEB), and Intelligent Cruise Control (ICC). When backing out of a parking space, the new Rear Cross Traffic Alert (RCTA) system can help to warn you about vehicles you may not see approaching from either side. The new Murano offers an available class-exclusive Around View® Monitor (ARM) with Moving Object Detection (MOD). Nissan’s advanced Zero Gravity seats are standard for front and rear outboard occupants. The rear seats are a three-cushion design – a first for a Nissan vehicle. Climate-controlled seats (heating and cooling) are available in front, along with available Quick Comfort™ heated rear seats. The available Power Panoramic Moonroof has a 40 percent longer sliding length and 29 percent larger opening than the previous generation design. It is projected to be among the largest moonroofs in the segment. The new Murano’s cargo area has been reconfigured (versus the previous generation) to provide a projected best storage space in the segment (with seats up). The 2015 Murano is offered in four trims (S, SV, SL, and Platinum) with either front-wheel drive or intuitive all-wheel drive. Popular Science magazine chose the 2015 Nissan Murano for a “Best of What’s New” award. Having been inside the new Murano and behind the wheel, we can absolutely vouch that this Murano is a huge step forward in luxury and design, while continuing to offer the technological and convenient features that today’s drivers both want and need. If you’re in the market for a crossover vehicle to accommodate your lifestyle, we hope you’ll consider coming down to check out the 2015 Nissan Murano. If you have any questions about this model, feel free to contact us on Facebook or Twitter. Be sure to check out our photos of the all-new Murano on our Facebook Page. The Next Gen SUV is here! No wonder Nissan calls its all-new 2013 Nissan Pathfinder “Our Most Innovative Pathfinder Ever!” With its EZ Flex Seating System™ with LATCH AND GLIDE™, and the supercool Around View® Monitor, Nissan does not disappoint! a family sees a road closure and asks a local for directions and he says, “Follow me!” and proceeds to lead them across all manner of rough, rugged, slippery terrain and the Pathfinder just walks right through it all with the family safe inside. With the all-new 2013 Pathfinder, Nissan returns to its roots – the Pathfinder has been a foundational vehicle in the Nissan line for more than a quarter of a century! The new Pathfinder’s combination of next-gen SUV design and smart technology brings a fresh approach to this segment of the auto market. A switch was made from body-on-frame to a unibody construction, earning the new Pathfinder the highest standard towing rating in its class (5,000 pounds! ), while simultaneously offering the best-in-class passenger volume and an increase in fuel economy of over 30%! Nissan’s Easy Fill Tire Alert – When filling the tires, the Pathfinder’s Easy Fill Tire Alert will give you a beep of the horn when you’re at the right pressure. How cool is that? Around View® Monitor – Using four cameras, the available AVM creates a composite image of the Pathfinder from above and displays it on the touchscreen monitor. This helps to visually confirm the vehicle’s position and allows the driver to maneuver into parking spots with ease and caution. Advanced Drive-Assist™ Display – This feature helps drivers keep their focus on what matters most—driving. It is a 4.2-inch color monitor sitting right in front of the driver in the gauge cluster. The customizable, easy-to-read screen displays front and rear power ratios, the trip computer, tire pressure, fuel economy, external temperature, and much more. Next Generation Xtronic CVT® – Pathfinder’s new CVT eliminates gears by using a precisely-machined metal drive chain instead of traditional fixed metal gears, which transfers power from the engine to the wheels far more effectively and smoothly. So whatever you ask from the engine, the CVT provides it by shifting seamlessly to give you the perfect speed, all while improving fuel economy. Best-in-Class Fuel Economy – Nissan dropped a bunch of weight from the frame, the drivetrain, and everywhere else! Even the climate control system weighs less now, so it’s easy to get the best fuel economy in its class! The EZ Flex Seating System™, an industry first, enables a second row seat to tip up which allows easy third row access with a child safety seat still installed. Speaking of the third row, it’s been upgraded and expanded for 2013. Pathfinder is the only SUV in its class to offer reclining seats back there, and they’re big enough to comfortably seat two full-sized adults. The Pathfinder seats 7 passengers, and everybody travels in style. 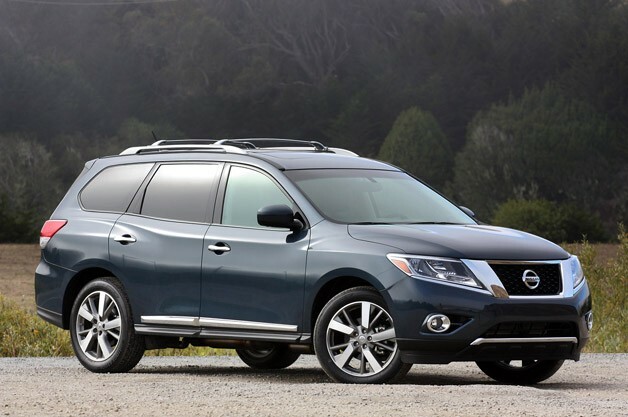 We love the all-new Pathfinder, and we know you will too! Come on over and take a test drive to get an idea of how the roomy new Pathfinder can be a great investment for your family! In the meantime, please share your questions, thoughts, and comments with us below. We would be glad to discuss these with you as soon as possible!